In a designed world defined by paradox, duplicity and ultimate possibility, where do you stand? In the quest to “solve” the world’s most pressing challenges, are designers problem seekers, solvers, or makers? There’s been a global paradigm shift. In today’s dynamic social climate designers feel a sense of ethical responsibility. However, all actions bear unintended consequences. 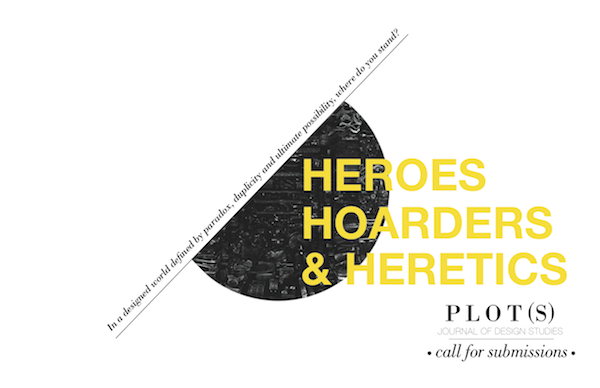 Considering this, how does design produce heroes, heretics, and hoarders? This edition aims to explore these issues whilst also answering the questions raised by design studies. Do things and technologies shape humans, or do we shape them? How can the agency of things contribute to human pain? Why do we design and for whom? How do things mediate our interactions with the world? How are we socially conditioned by designed things? How do we delegate our morality to things? Plot(s) Journal of Design Studies is an annual publication edited and produced by members of the Design Studies department. It is a student-run journal at Parsons the New School for Design, which aims to articulate the ways in which myriad forms of design practice shape and transform the human experience. We are seeking academic writing, fiction, non-fiction and visual narratives, artwork, and projects to be published in the second edition coming out Spring 2015. Submissions are open to students, recent graduates and practitioners affiliated (or not) with any institution. Submissions should be between 500-1,200 words, with the inclusion of up to four images. Photo essays or visual narratives can include up to 8 images. All references must be properly cited as endnotes and formatted in Chicago style, upon submission. Images must be at least 300 dpi, must have copyright permissions, and include captions. Authors are encouraged to include a one-line bio with their submission(s). Up to 3 pieces may be submitted for consideration.